To create aÂ AccountÂ you have to enter your email and click onÂ "Add Account"
The new account will appear into a list on the left side (as the image below shows). You can select an user and manage his data. You can permit to user to manage the intereÂ website of some part. 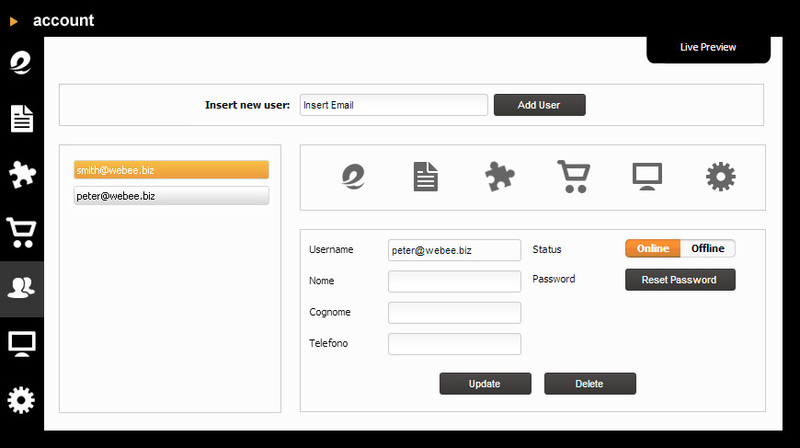 The Webee management is sectioned into macro-areas:Â Logo - Page - Â Widget - Settings - Template.Â Â You can delegate one or more accountÂ to manage each of these areas. You can also let them to organize specific areasÂ (e.g.Â webmaster, webagency). They have to register to the site,Â or you can register them. Then you need to authorize and give them the permission to the management. To permit to manage an area you have to select an account. Now you canÂ confer on himÂ an areaÂ . The areas assigned to an account will be highlighted in orange until you cancel the authorization. In the above example let us suppose theÂ smith@webee.bizÂ account controlsÂ theÂ logo andÂ ecommerceÂ area (highlighted in orange), so the user will not manage the other website areas. You can cancel the authorizations when you want. The icon turn into not highlighted status (grey). You can controll theÂ "online / offline"account status, thel name,the surname and phone number. The system allows you to update theÂ passwordÂ if the user lost it. You have to Save changes.